Please pardon this "group reply" to the kind comments from fellow Voxers: I spotted the leaf (previous post) in our parking lot yesterday –all those perfect beads of rain, the leaf so dramatically floating over black asphalt– and photographed it. I was so compelled to capture the image after glancing at that leaf that I walked through the rain to my office, retrieved my camera, and went back out in the damp to shoot. It felt like a sad image. This morning I learned my mother had a very serious medical problem; I posted the picture because it illustrated how I was feeling. It is beautiful and it is sad. Mom, by the way, though hospitalized, is doing very well and is constantly on my mind. Spike, after I shot the faded yellow leaf I walked about 20 feet over to a tree and photographed a red leaf wet by the same rains. Not really done for you but, what the heck! I hope she gets better with time James. Pleased to read that your mother is doing well. 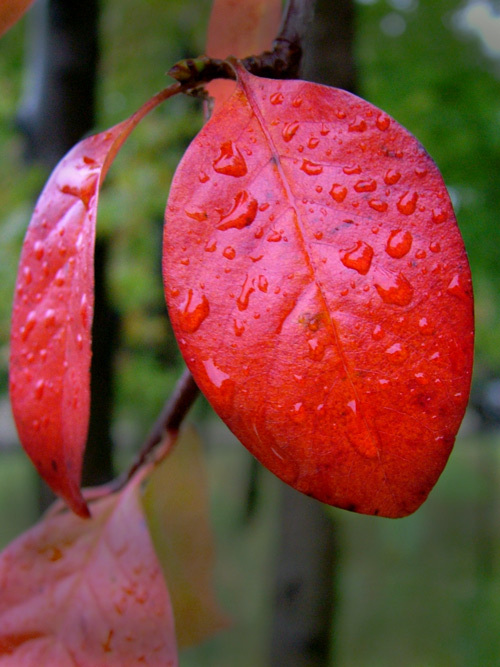 Lovely red leaf.